Many people find eating out alone daunting, but I find the experience quite relaxing. I have fun people watching, there’s no one else to set the pace of my meal and I can focus on the food. 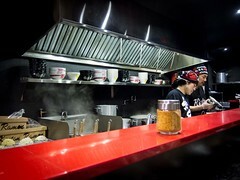 Ramen and noodle shops are perfect for the single diner. Many restaurants have bar seats, serving sizes are tailored to be ordered individually, food arrives quickly and you can take your time or be done just as quickly. 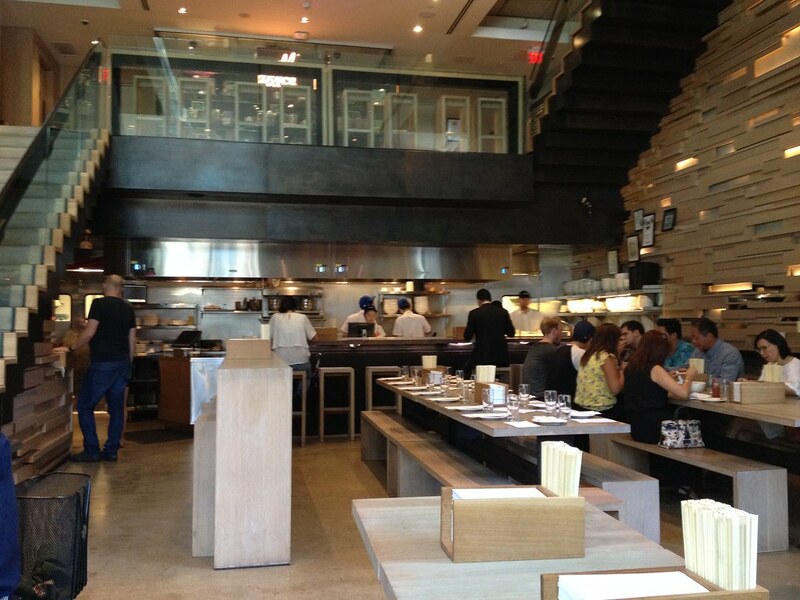 At Momofuku Noodle Bar in Toronto, a row of single seats facing the street were perfect for my recent solo lunch. Atmosphere: The Momofuku complex in Toronto features 3 restaurants in addition to a Milk Bar and the first floor noodle bar. I arrived before noon on Wednesday afternoon, just after doors opened at 11:30am. Only a few seats were taken, but in the span of 20 minutes, the space filled with eager diners. Most of the lunch crowd were suits who worked nearby but I was surprised by the number of tourists, the diners who stopped in front of the Zhang Huan statue before looking for the entrance. Lunch was busy but casual, clearly still a popular spot. Service: When I walked into the restaurant, I didn’t realize the casually dressed girl near the door was actually the hostess and not a guest. She showed me to a window seat and my server came by right as I settled in. 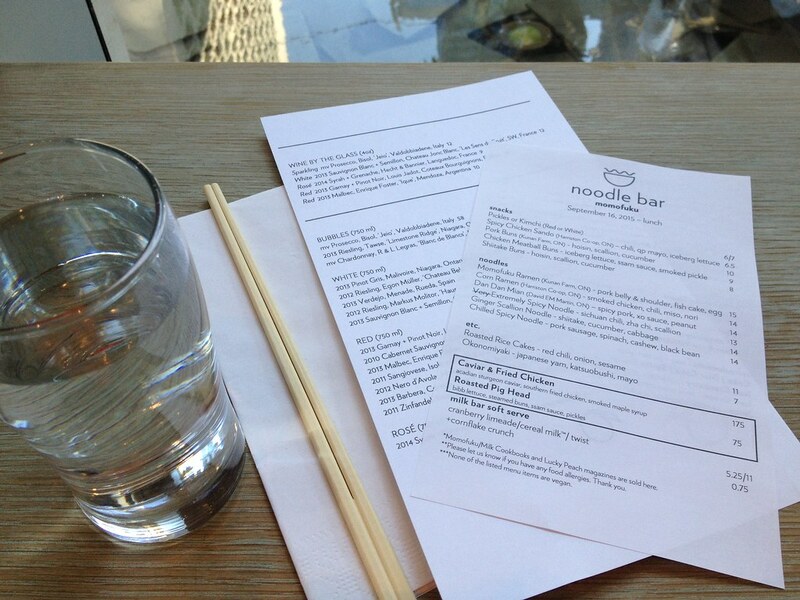 I was provided with menus, asked for my drink order and then left with time to peruse the noodle bar offerings. I felt that my server was friendly, always close by if I needed anything and incredibly efficient. My entire experience at Momofuku lasted no longer than 25 minutes and was just what I was looking for (having to rush back uptown for work). 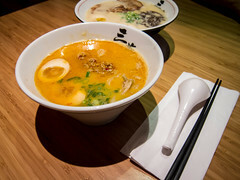 Food: Being my first visit, I ordered the Momofuku Ramen. Breaking the bowl down into the three components, noodles, broth and toppings. 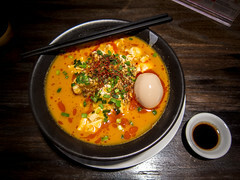 Chewy, thin ramen noodles were used, perfect for slurping and matched the lighter broth. I was content with the serving size, but can see how others would like more. There was no menu option for extra noodles. 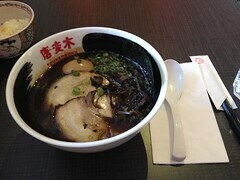 While the broth was on the lighter side, still clear, the flavours were rich. There was also this spoonful of deliciousness (bacon fat? flavoured lard? what was this?) that, when stirred into the soup lit up each spoonful. 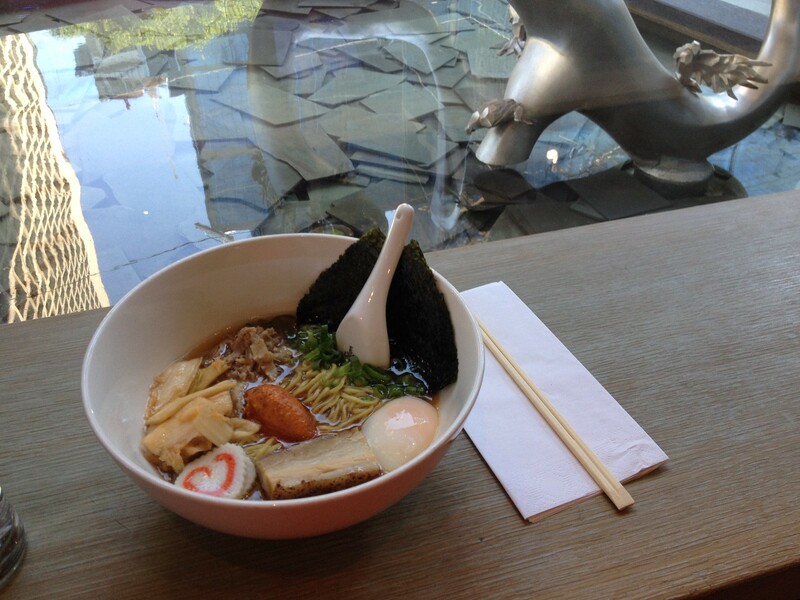 I found the broth sweet and savoury, a lovely change from the usual overload of salt. 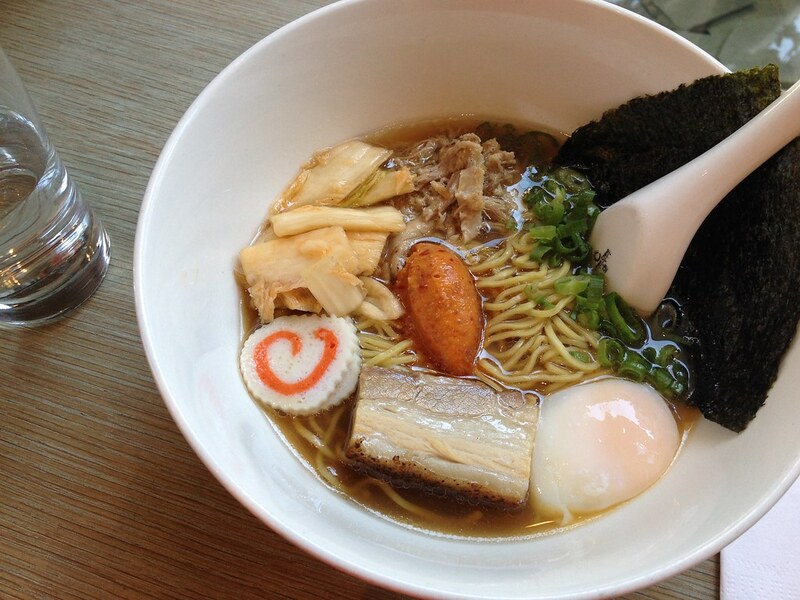 As for toppings, Momofuku won be over with the perfect poached egg. I do love the traditional marinated soft boiled egg, but I could see my loyalty swaying. I also liked the sourness of the kimchi, which was another nice change from other ramen shops. The thick piece of pork belly was melt in your mouth and the shredded pork shoulder was super tender. Fresh chopped green onions and two pieces of nori added freshness and umami to the dish. My only gripe was the bill. 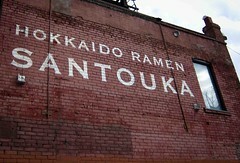 After tax and tip, my one bowl of delicious Momofuku ramen came to just over $20. Not bank breaking, but not cheap either. Although the same bowl is priced at $16 USD ($21.5) CAD) in New York, pre tax and tip, so we’re getting a deal comparably.